It is wise to educate yourself before you begin the shopping process. 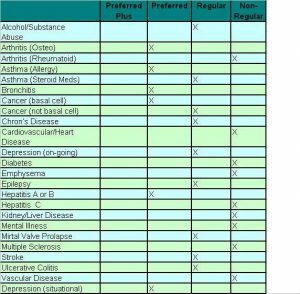 Having a good understanding of the qualifications for each health class will make comparing rates a breeze. I do warn you, these ratings are not binding and subject to change based on other criteria. For example, though your health will qualify you for a specific health class you may drop in health class or be charged an additional flat rate based on other factors, such as whether or not you are a pilot or scuba diver. As you can see depression is listed twice. If you are currently being treated or had been treated in the past for situational depression you will still qualify for preferred ratings. Situational depression can be triggered by sudden change or trauma and does not typically last long. Because of its short lived nature, insurance providers recognize their are not much long term risks associated with it and the symptoms tend to disappear in time once you have adjusted. However life insurance for depression (major or on-going) would be more expensive since the best rate you would qualify for is regular or standard. Use only as a guide. I share this information with my clients as I believe in complete transparency. There are no gimmicks here. Unlike other companies, I will not mislead you in any way. If you have received a better quote from a competitor, such as SelectQuote, please share it with me. I advocate for all my clients and always fight to get you the best rates available.